I’ve always been a big fan of Netvibes (and Pageflakes!). These types of online “commander” software programs allow you to aggregate information from RSS feeds, Web sites, and even e-mail into one central location. I’ve recently revamped my public Netvibes site to aggregate some of the most interesting and active Music Education Bloggers and Podcasters and post their headlines in one easy to read location. While there are many great music education bloggers now blogging (many in part thanks to the 100 ME Blogger Campaign started right here at MusTech.net), I’ve chosen only to list a dozen of the more active Music Education bloggers (meaning they post new material frequently). These sites may be found under the “Current Music Education Beat!” tab at my Netvibes site and each respective headline links directly to the blogger’s website. In addition, I’ve included a list of public Music Education and Technology podcasts that may be played directly from my NetVibes page. These podcasts may found under the “Best Music Education Podcasts” tab at the Netvibes site. 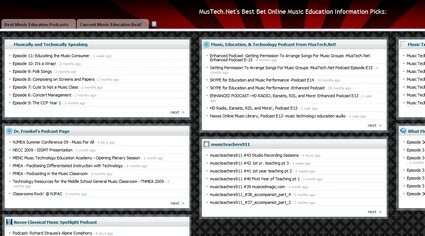 Music, Education, & Technology Podcasts from MusTech.Net! I hope you bookmark this page and start taking advantage of the seemingly endless possibilities of RSS for acquiring information from the Internet. Please note that Netvibes is free and anyone can join and make and share their own pages! Note, there are hours on end of great podcasts to listen to, share them with your students and friends!